It’s once again time for the ATHS CCC Truck Show and BBQ. This year’s show will be on Saturday April 27, 2019. Come help the members of the Central California Chapter ATHS Celebrate 33 glorious years in the beautiful Mother Lode. Great trucks, great food, and great friends what more could you ask for? You’ll see more than 200 trucks from California and surrounding states. We will have the now famous ALL BEEF ATHS Hot Dogs for sale as well as Ice Cold Soft Drinks, popcorn, candy and many other wonderful treats. Last year we did sell out of dinners so please place your order as soon as possible. This years BBQ dinner will be served by Incahoots BBQ Catering out of Fiddeltown CA. We will start serving dinner at 4pm. Orders for dinners placed after the April 15, 2019 date will be $22.00 per person. Last year we did sell out so please place your order as soon as possible. Dinner Tickets and Registration Cards are available for pick up Friday 8am to 4pm and Saturday 8am to 11am at the registration booth. Truck Gate opens 8am Friday and 8am Saturday for show trucks, unloading and parking. The fair grounds are on the left about 1/2 way through town. RV dump available on fairgrounds. All vehicles must have current registration, insurance, chock blocks, and fire extinguisher they will be checked at gate. Chock blocks must be used at all times on all vehicles. 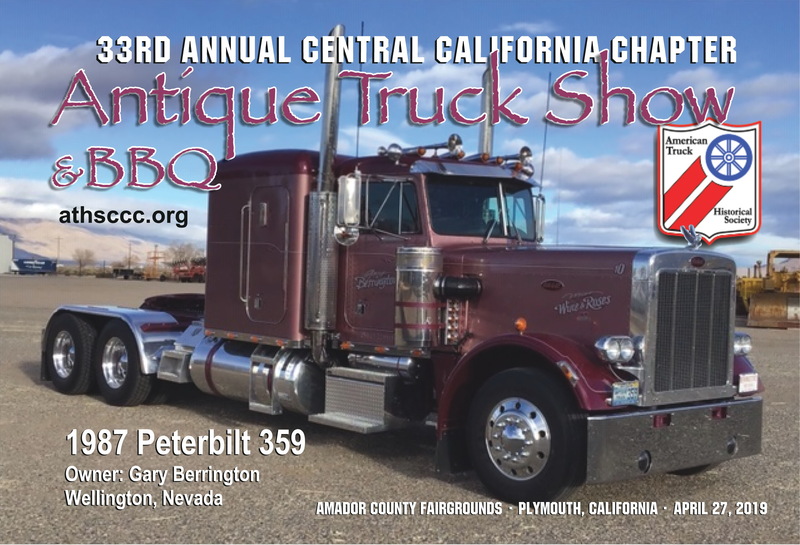 This year’s ATHS CCC Truck show will feature live operation of the steam powered sawmill on the Amador County Fairgrounds. The authentic 19th century sawmill is run by the powerful 1907 Corliss single cylinder steam engine with a 7 ft. flywheel, and will turn giant logs into useful boards as they pass through the 48” circular blade. The 1890 Smith & Sayer steam engine will again come to life to drive the sawdust removal conveyor. Watch the sawmill crew muscle a huge log onto the carriage that moves it through the 48” saw blade. Watch as the Sawyer communicates with hand signals to direct the efforts of setters and off-bearers. Take a look in the Engine Room and be hypnotized by the rhythmic machinery huffing and puffing, turning steam into 60 horse power. more important is our increased ability to educate young people about their American heritage. By recreating a live 19th century Sawmill, we provide a glimpse into Amador County history and one of the three traditional industries here, Logging, Mining, and Agriculture. The Amador Sawmill is one of the last operational steam powered sawmills in California. The sawmill is operated by ASMA, a non-profit 501(c)(3) organization supplying rough-cut lumber and timbers for projects that require time-period saw marks for their restoration. The sawmill is a living history museum using turn of the century (1890-1910) steam power operated by volunteers.